I have heard of many wonderful miracles. I have seen healings where the person being healed said he or she could feel the healing taking place even though it was completely internal and I saw nothing. I have seen people healed of pain, which is a bit more visually obvious to others. I personally have been healed. You would think I would not doubt God's love, but I do at times...because I am human and human nature is a harsh reality in a world of reality and harshness. We tend to believe what we see and know what is material. While unbelievers would say things like if there is a God, you would think He would make himself known, I see all His creation proclaiming Him—when I want to, that is. Sometimes—probably most times if I am to be honest—when I am sitting at a desk and typing our my thoughts, I see a desk and computer, same as unbelievers see. What I should see...well, what should I see? God knows. God knows this. God knows this about us. God knows all this about us. God knows all this about all of us. Yesterday, I saw a miracle. It was one of those miracles that I have have heard about yet never had seen for myself. This miracle started with a little prayer group in a little room in a little gift shop in a little city...just two hours away from my little space. Just a handful of people who prayed, who sought God, who were told to that He would show them something after the inauguration of the President in January. A new Bible of one of those members began to produce oil. Oil so pure that it is clear and odorless. Thick and yet when placed in the eye or in the mouth it seems to becomes more like a water-based substance. 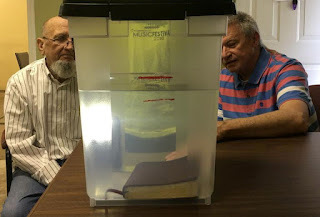 When it began, they thought a grandchild had spilled something on it, When it continued to spread throughout the Bible, they placed it in a plastic bag. When it filled the bag, they placed it in the clear tote. The Bible stays engulfed in the oil that continually replenishes. In fact, God told them that as long as they do not sell the oil and give it away, it will replenish. It has been analyze and they were told it is like mineral oil but not. It is thicker and has properties that no one can explain. God told them that they were to go out. Even in the sermon, the preacher mention how we are accustomed to say "come." Come to my church. Come to the alter for prayer. But Jesus told his disciples, told us to "go." So, this little group of people have had their lives changed because now they go out transporting a tote with a Bible producing oil to various churches to spread refreshing news about God and His love. They have only gone where they have been told by God to go and they do not accept invitations. They give the oil freely but differently than when they first started. Weeks ago friends of ours watched quart jars being filled while the oil stayed at the same level. They watched people dipping their hands in it and yet it stayed clear. However, now that so many more people know about this oil, God has told them to just give out small vials. They fill vials on Monday night and send some out as they receive so many requests. They place the Bible in a tote until it fills and then in another. 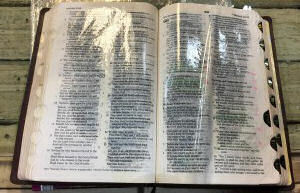 Oil is also dripping down in the prayer room. One man, who goes to the prayer room on some Mondays, told us that when they open the Bible, each book has a different aroma! Imagine that from an oil with no fragrance. What is the oil? They describe it as the presence of God, they call it Flowing Oil. To me, it is that and something that I would describe as a purest white light in oil form. It is like...pure love. The oil will sometimes multiply on a person, usually one gifted with healing, but not always. Some say a small vial has lasted them a long time or would refill! And while the oil is a gift, I think the miracle was a small group of people, who were seeking God in prayer in a little room, being chosen to share this gift. Whenever we think, who are we...whenever I think, who am I is insignificant, I will think on these people, because I want to live in God's natural realm of the miraculous and supernatural. My Lord, my world is so small, but keep reminding me that it is not insignificant. I was thinking of two friends of mine in particular yesterday. One who is struggling financially and in need of her finances to be replenish like this oil replenishes. Another, who has a very small church, who may be feeling their efforts are rather insignificant, but are not to You. I ask that you bless them both...significantly. Thank you, my Lord.